We have recently learned that the rumour that the Old MacDonald's Farm will be expanded for 2001 are false. The rumours started when some construction work was spotted in the area during the last few days of the 2000 season. Understandably, this created speculation that the farm barn may be extended. 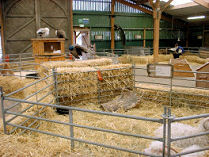 Unfortunately, it seems the construction was only for the building of a hay shelter for over the winter. If you are new to the park, make sure you pick up a free condom.